So this is it. I become a 50 year old runner later this month. I now carry an AARP card in my wallet. Seriously looking forward to the discounts. I’d like to say I’m also looking forward to being more competitive in my age division, but that’s doubtful in Colorado. In my defense, I’m about as competitive with the 25 year old age division. It seems to be that way with distance running – you can only slow down so much without tipping over. Truthfully, it’s not unusual to maintain or even increase aerobic capacity with age. Sort of like nose and ear hair. And I can honestly say I ran the same Bolder Boulder 10K time in 2011 as I did in 1991 – 48 minutes. Of course I ran a 41 minute 10K in 1990. Not sure what happened in ’91 other than Brit being born. Karen recalls my favorite phrase at the time was, “I’m putting on sympathetic pregnancy weight”. I’ve always been a team player. I would like to improve my speed a bit because I like racing fast, but it’s more important to me to simply be fit at this age. And to demonstrate that, I am planning for a big year of runs. I’ve already run 3 half marathons this year. 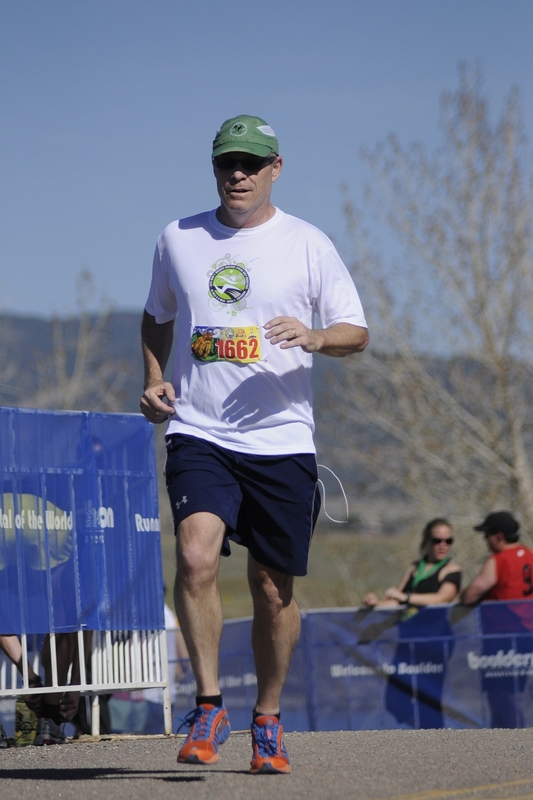 The picture above is of me finishing the 2012 Boulder Half. My next big event is a 25 mile trail run at high altitude – the Collegiate Peaks Trail Run on April 28th – four days after I will have turned 50. I expect to run that with my high school cross country buddy Rob Graham. The dude’s 51 and I struggle to keep up with him. The next run I’ve registered for is the 2012 Bolder Boulder. My goal there will in fact be speed as I would like to beat last year’s time. Or if not, if I can just beat some of my neighbors I’ll be content. I expect to run more half marathons. I like that distance – mostly on trails. And then, assuming I’m in shape, I would like to run the Denver Marathon again in the fall. Or perhaps the Boulder Marathon which I’ve never run. And the biggie of the year will be a return to Ouray for the Imogene Pass Run. That’s only 17 miles but in my estimation is much harder than a marathon. I do that and it’ll be a good year.